"My take on the classic Peruvian ceviche. The acidity of the citrus fruit 'cooks' the fish. A nice refreshing meal on a hot summer day. It's imperative to use only freshly caught fish!" In a medium non-reactive bowl combine the lemon juice, lime juice, ginger and olive oil. Add the bass and toss to coat. Cover and marinate in the refrigerator for about 2 hours. The flesh of the fish should be white and opaque. Add the cilantro, onion and avocado. Season to taste with salt and pepper, toss and serve with hard cooked egg wedges. See how to make a refreshing chilled fish salad. We substitued mango for the egg and left out the ginger. 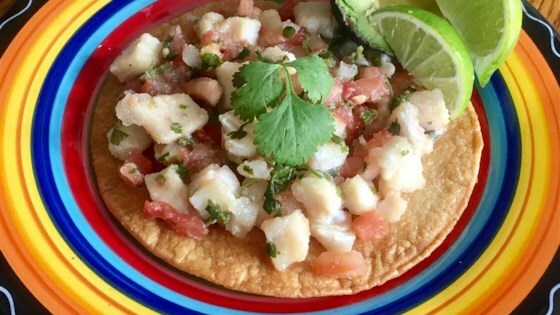 The warmth of the mango really contrasted w/the citrus and made this ceviche absolutely divine. Fresh fish is a must for this recipe. A great pool side snack on a hot summer afternoon. I make this with shrimp instead of halibut and it turns out great everytime. My only comment would be that the marinating time seems a little short.